The Stone Roses have done what most thought was unthinkable and impossible by reuniting the original lineup for a tour and word has it a new album from the Manchester legends is in the works. I haven't heard of any proposed US dates for Stone Roses; I'm keeping my eyes open but not getting my hopes up for it. I never actually thought they'd reform in the first place and one gets the sense this could all still implode spectacularly at any moment. Maybe not. Maybe we're all still a little gunshy after the childish antics of certain member(s) of Guns N' Roses at the Rock & Roll Hall of Fame and a bit skeptical of the stability of the almost-reunited Van Halen. The main story here is, of course, the Roses reforming but when the announcement came I found myself thinking about another legendary Manchester band and how they might be impacted by ReunionFever. 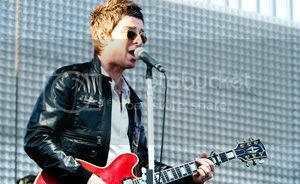 It would have been a no-brainer for Oasis to open shows for Stone Roses but alas, we're waiting for the (inevitable?) reunion of the Brothers Gallagher, which likely won't happen until well after the Roses again go their separate ways. That doesn't mean Noel and Liam have taken this Roses reunion off, however as Beady Eye (Liam's band) have opened for the Roses and now Noel Gallagher's High Flying Birds have done the same. Noel has mounted a more ambitious tour for his solo debut than I expected, and I got to see him perform at Atlanta's Tabernacle earlier this year. I don't have footage from that show but we do have a performance of the great track "Dream On," performed at The Stone Roses' Scotland show over the weekend.